It is important, and a priority at St. Stephens Indian School, that we embrace our American Indian culture. One of the first things a visitor to our school campus sees is a handcrafted metal eagle, a beautiful representation of our school mascot, donated by one of our community members. Masterful architecture brings Native American imagery to life. We are proud of who we are and our Native American heritage, and it shows! Just walk our halls—you can't help but want to soar with our Eagles! We teach our students to show pride in their Indian heritage. Each morning, students recite the Pledge of Allegiance in their native Arapaho language. 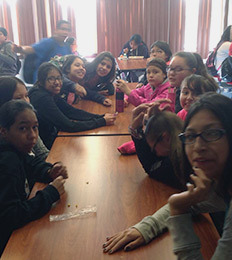 St. Stephens Indian School maintains a culturally relevant atmosphere throughout the school.